Knee-jerk reactions tend to miss the mark more often than not. If there is a water leak in your house, spending too much time trying to figure out how to stop the dripping in one location takes away from stopping the leak altogether. Running unnecessary tests on patients in order to avoid the risk of a malpractice suit, or to appease a pushy patient is considered defensive medicine. This defensive position is also symptom-based medicine and is very reactive. People want an immediate response when something goes wrong. · You go to the doctor with a fever. · You want something to make it go away. · You take a pill to suppress the fever and address nothing. The U.S., as a society, is reactive. Many times we respond to whatever is going on instead of working toward a goal. Defensive medicine is part of the reactive system. It’s rule out, rule out, rule out, but things never get fixed. 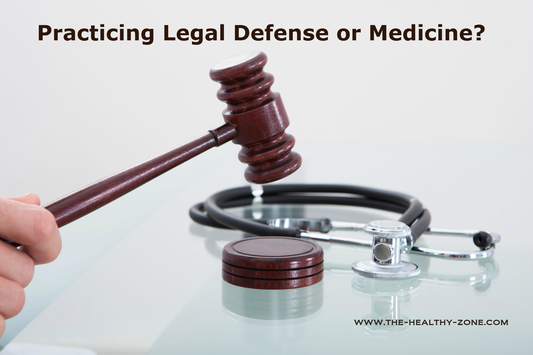 Some 73 percent of physicians admitted to practicing some form of defensive medicine in the previous 12 months,according to the 2010 Gallup-Jackson Healthcare nation-wide survey and report. With so many doctors admitting to practicing defensive medicine (running extra tests to avoid a lawsuit), it’s no wonder healthcare costs so much money. The survey also revealed that one in four dollars spent in healthcare can be attributed to defensive medicine. Some of the estimates show that our nation spends about $650 billion annually on defensive medicine. Eventually it will bankrupt the U.S.
One way to combat this defensive medicine reaction in doctors is to educate people not to be reactive. Start by educating the public in school, and continue through the media coverage. Stop advertising medicine on television, radio and in magazines. You frequently hear or read, “Ask your doctor if this is right for you,” or “Tell your doctor if you are allergic to this medicine.” Because the ads run through the disclaimers so quickly, it numbs the people. So, shouldn’t your doctor know if it is right for you? If you’ve never taken it, how do you know you are allergic to it? So much double-speak. Traditional healthcare and alternative medicine differ quite a bit. Alternative medicine views the body as a whole and uses natural measures to help the body heal itself. Stop your part in the reactive medicine cycle and work toward the goal of health with your alternative medicine practitioner. If you would like to continue this discussion, feel free to contact me, Linda Dulicai, at 540-428-1949 or linda@The-Healthy-Zone.com.